I used to count caught fish, diligently noting species, length and fly used. I’ve since simplified things. There are, or at least were before the anthropologists found them, several tribes in the world whose counting system has only three numbers: one, two and many. That wasn’t quite what I was looking for so I’ve modified that to be one, a few and many. Sunday was a “many” day. I was on a tiny little brookie stream (and the only clue I’ll give you is that it is tributary to the Beaverkill). 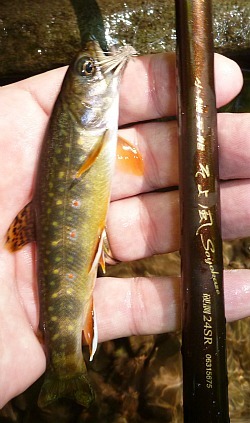 I started the day fishing a 9’ Soyokaze 27SR, which I’ve come to view as the perfect brook trout rod. As I climbed higher and the stream got smaller, I switched to the 7’8” Soyokaze, and finally ended the day with the 6’6” Soyokaze. It was one of those days you daydream about while sitting at your tying table. 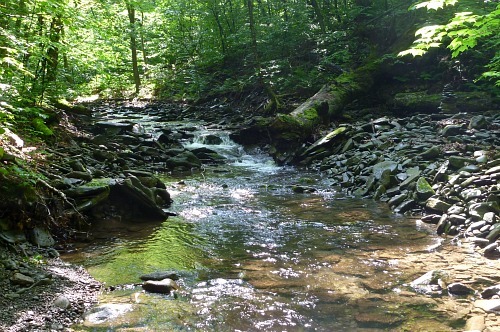 The stream was pretty much just a series of plunge pools, and every pool yielded two or three brookies. Mountain stream brookies don’t get very big, but if you match the action of the rod to the size of the fish you still get a very satisfying bend in the rod and you can feel every head shake. 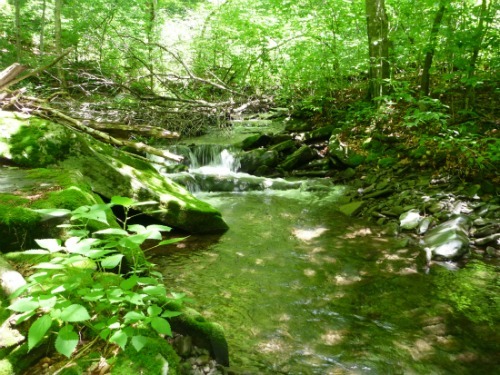 For small streams such as this one, you also have to match the length of the rod to the size of the stream. Of course, if you are fishing in the Sierras where the streamside foliage is all conifers, which grow up rather than out, you can get away with a longer rod. And if you are fishing in Japan, where typhoons cause such frequent flooding that there is no streamside foliage along many streams and it seems every stream has sections of retaining wall, you can even use an 11’ or 12’ rod. 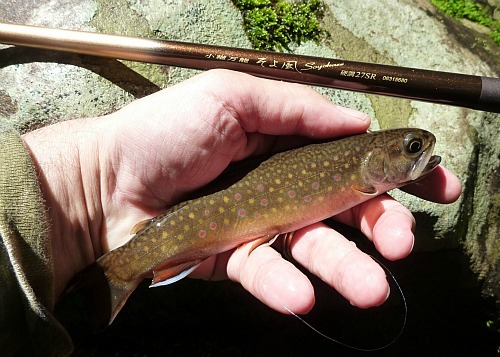 To fish a brookie stream in the eastern US, though, you need a shorter rod. What is generally recommended (generally by people who don’t fish eastern brookie streams) is to collapse one section of the rod if you have an 11’ rod, or maybe even two sections if you have a 12’ rod. You can do that. You can even still cast it. But it’s loose. The collapsed sections rattle around in the grip. When you are used to casting a rod so sensitive that you can feel when your wet fly leaves the water on your back cast, when you don’t have to check if it has a bit of moss on the hook because you know from the feel that the fly is now heavier, you don’t want a rod that rattles when you are casting. Trust me on this one, you don’t. The feel is gone. I read recently that Dr. Ishigaki thinks it is a shame that there are short rods without cork grips on the market. I’ll tell you what I think is a shame (was a shame, actually). I heard a story about when Dr. Ishigaki was in the Catskills in 2009. I wasn’t with him on that particular day, so I don’t know if it actually happened, but the story certainly has the ring of truth to it. He was fishing a small stream, not the same one I was on, but similar in that it is also a stream known for wild brookies and it is also tributary to the Beaverkill. At many of the most productive looking pools, he didn’t even cast his line. His rod was too long. I suspect he was using his Shimano LLS36NX, a 12’ rod which casts beautifully (if you have room to cast it). Word is he helped design it. The thing is, though, he designed it for Japanese Iwana streams, not for Eastern US brookie streams. So there I was, someone with a passing knowledge of tenkara, using a rod that that is too short, and doesn't have a cork grip, one that's a shame I am selling, catching multiple little wild brookies in every pool, and the Japanese tenkara master couldn’t even cast. Considering that he had flown half way around the world to be there and to fish for wild brookies, now that's what I think is a shame. 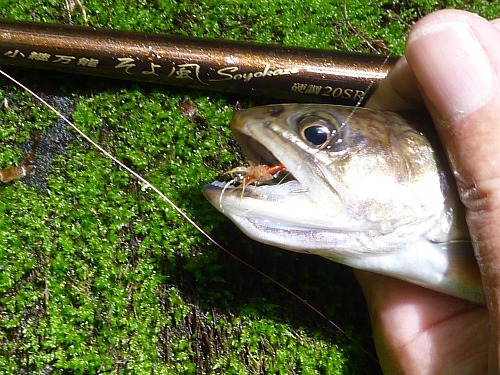 The whole point of this essay is that you should not get caught up in the dogma of what is and what is not a “tenkara rod.” Tenkara is the best way to catch fish in high gradient mountain streams. However, and I feel very strongly about this, the best way to fish is with a rod that matches the stream you are fishing and the fish you are catching. If you are fishing a stream that is lined with trees and bushes and has low overhanging branches and in spots you can almost step over it, tenkara fishing with an 11’ rod “because it has to be 11’ to be a real tenkara rod” is just not logical. It is just as illogical to insist that a rod that weighs less than 1.7 ounces have a cork grip. Why? You are not going to get blisters. The rod feels like it has the swing weight of your average soda straw. To those who seek to live by Yvon Chouinard’s comment “The more you know the less you need,” know this: you don’t need cork on a sub 2 ounce rod. In addition to matching the rod to the size of the steam and the size of fish, you of course have to consider the action of the rod. In this regard, I would council that you be much more concerned with how the rod casts than with what the rod says on it. I have now cast many different tenkara rods from a number of different manufacturers, and I can tell you from experience that some rods that don’t say "tenkara" on them cast a light tenkara line better than some that do. Does that make them tenkara rods? Not really. Does that matter? At all? Really Not. If the fish you are catching run from 4 to 8 inches, fishing with a rod that will handle a 7 lb brown in New Zealand or an 8 lb salmon in Wales is just not nearly as much fun as fishing with a rod that was meant for smaller fish. Fishing with a rod that weighs over 3 ounces is more tiring than fishing with a rod that weighs under 2 ounces, no matter what material the grip is. And a rod that's so long you can’t even fish with it? Well, that’s just the wrong rod. Even if it does have テンカラ written on it.